← Who can help with my computer? Select fire 9mm carbine from JP Enterprises, with the new AmTac reflex suppressor and Vortex red dot. Desert Tech Covert .308 rifle with their suppressor and US Optics 5-25x scope. Just the combination for ringing steel at long range with ease and consistency. In Tennessee, 200 yards is often beyond line of sight. In Utah, 500 just barely gets you out of the driveway. I can see why faster, flatter shooting rounds are so popular there. 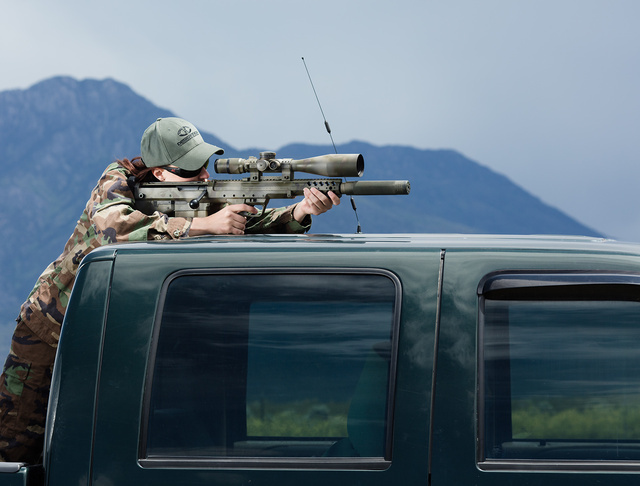 This entry was posted in rifle, sound suppressor, weapon and tagged 308, 9x19, optic. Bookmark the permalink. NICE colors! Looking at the high res, it’s a really cool photo. Wait; does that scope extend beyond the muzzle? 25x? Holy smokes. The “deep space telescope” on my 308 maxes out at 14x, and I don’t recall ever wanting more. On a ten inch plate at 700 yards we were having a gay old time with it. Put a brand new shooter behind it at Boomershoot and she popped that plate with her first shot. We had it doped for conditions already, but the point is she could see the target just fine. Anyway, there’s a whole debate there, and if some like a lot of magnification, who am I to tell them they shouldn’t have it? The point is to get out in various scenarios and conditions and work with what you have. In the field (meaning random locations and random conditions, on targets of opportunity which may or may not ever show, i.e. hunting) I’ve found that resolution, light transmission and ease of target acquisition are the main issues (besides marksmanship under time pressure). I’ve had several hunters tell me they’d missed an opportunity because of having too much magnification, but I’ve never been told that a shot was missed due to too little magnification. A groomed range on a nice day with perfect lighting on a stationary target at a measured distance from a benchrest with plenty of time is an entirely different matter, having no relevance to practical shooting other than being a means to test loads and zero your sights. So; I dig the setup, but question the magnification. That is to emphasize “question”. There may be a very good answer.